Oh brother, here we go again. I was doing some work on my Dad’s office building. Specifically, I was removing mildew from the stucco siding with a pool brush on a long pole. As I rounded the corner to the back side of the building, I couldn’t help but be distracted by the hippo pool. 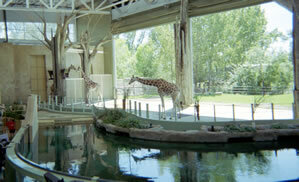 It’s a good picture of the moat, but I don’t know how those giraffes got in there. There are no giraffes in the hippo moat at my Dad’s office building. But anyway, back to my story. I was standing there half watching the hippos, half scrubbing the mildew off the stucco when I heard this noise in the distance. Thundering. About a half mile away, across the field next to the hippo moat was a rising cloud of dust and emerging from the dust were horses. Wild horses. No really. Why are you looking at me like that? These horses were being herded by several cowboys. I’m not talking about several horses either, I’m talking hundreds and hundreds of them! And they are heading right towards the hippo moat. Fast. Well I must have looked like a deer in the headlights because my dad started hollering at me and you can guess what he was hollering — “Pay attention to what you’re doing idiot! You’re here to clean the stucco, not be gazin’ at the neighbors”! By then, the horses were within maybe one hundred yards of us and I continued to watch as most of the herd took a hard right turn and started heading to the parking lot. Lots of them though were not turning and ran smack into the hippo moat! I kid you not; there must have been a dozen horses frantically swimming in the moat while hippos snapped at their heels, or hooves or whatever. I could see some of them being pulled under and I could see blood in the water when I realized my dad was still talking to me. “Well, are you just going to stand there or are you going to get back to that mildew”! “Dad, there are horses in the hippo moat”, I said. “Oh”, he replied. “Well I guess you better go tell Mr. Johnson then”. So off I went to find Mr. Johnson. It wasn’t until I had run out into the street that I realized I didn’t know who Mr. Johnson was. About that time, the Stampede had made it into the street and was headed right toward me. I jumped back onto the curb and watched them pass for what seemed like thirty minutes. As the dust settled behind the last horse, I saw several men standing on the other side of the street. One of them yelled over to me. “Did any of those horses end up in the moat”? “Yes! Are you Mr. Johnson?” I called back. 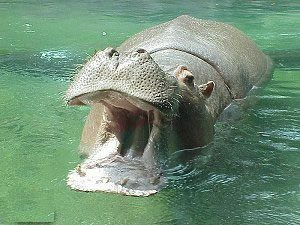 The men ran across the street toward the stucco office building, but instead of going to the back where the hippo moat was, they all went into the building. I ran in after them and asked Mr. Johnson where they were going. He said they were going to have lunch and then get the horses out of the moat. It was at this point that I got really upset and woke up. Again I have to ask. What do it all mean? Me: Do you guys even know who Jimmy Buffett is? Young Brett: I do! He’s that guy that turned up missing in the seventies that they think is buried in concrete in Giant’s Stadium. Young Andrew: Dude, that’s Jimmy Hoffa.